Founded in 1518 by a Royal Charter from King Henry VIII, the Royal College of Physicians of London (RCP) is the oldest medical college in England. The RCP is a professional membership body for physicians, with 34,000 members and fellows across the globe. As the leading body for physicians in the UK and internationally, the Royal College of Physicians works to achieve their vision by influencing the way that healthcare is designed and delivered, promoting good health and leading the prevention of ill health across communities, and supporting physicians to fulfill their potential. The RCP archive is bringing rare and unique historical materials to researchers, students and educators across a variety of fields and departments, helping shape public health today. Notable members and fellows include Richard Mead, William Harvey, John Brereton Barlow, James Cyriax, Ronald Ross, and Dame Sheila Sherlock. 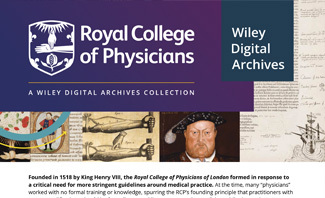 The RCP archive reflects the development of modern Western medicine, while documenting the interactions of the medical community between religious communities, monarchies, political systems, and the general public. There is also a good deal of information related to the establishment of medical practice standards and medical education, and to the extension and growth of the medical disciplines into the specialized fields of practice as we understand them today. The collection will be fully archived by Summer 2019. 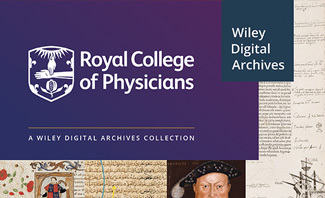 The Royal College of Physicians archive is perfect for researchers studying the History of Medicine, Medical Humanities, and the History of Science or History of Technology. The archive is also suitable for researchers studying Anatomy, Medical Law, Medical Policy, Medical Research (Disease/Treatment), Military Medical Practices, Public Health, General History Research, Gender Studies (Women in Medicine), Health Education, Health and Human Rights, Health Economics, Tobacco-related topics, Medical and Biological Illustration, Medicine or Science and the Humanities, or Social Factors in Health. The RCP archive stands out as a remarkable resource for British history studies in general, and covers over seven centuries of events and developments across the Western world.